Unlike many big adventures the day-trip out to White Island in New Zealand's Bay of Plenty began in a relaxed and leisurely way. It was up at 8am - very lazy indeed - and then after a quick tidy of the Whakatane motel unit it was down to the cafe at the White Island Rendezvous for a quiet breakfast of bacon and eggs and a very yummy looking toasted muesli and fruit salad. Then it was last-minute checks for needed equipment - cameras, batteries, hat, sunblock, water and away it was to the White Island Tours' boat. 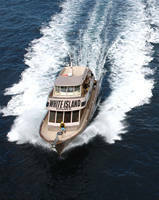 The luxury launch was specifically built for the tours to White Island. It has a cruising speed of 19 knots, thanks to twin 750hp Scania motors. It is hugely comfortable with plenty of room and seats for people - both inside and on its two decks - and there are two good toilets. There are large windows for viewing the surroundings, but it has to be said that for this traveller I like the fresh sea air and wind in the face. On the return trip we sat on the bow and soaked up the sun. You need to take your own water with you to White Island as in hot weather the heat of the day and the warmth of the island will have you working up a sweat. Also it's sensible to take a packet of boiled lollies along as the sulphurous atmosphere on the island can make your throat tickle and the saliva from sucking on sweets eases the problem. The trip out to White Island from Whakatane with Peejay Tours is very well organised with a brunch of hot soup and bread plus a lunch of fruit, sandwiches and a small crunchie bar. These are very welcome once you've returned to the boat from your excursion. When you leave the sheltered harbour at Whakatane you pass by a statue to the Maori maiden Wairaka, who saved an important canoe from being washed away by breaking tribal bans on women paddling, and into the bay. The water on the way out to White Island can be a little rough and if you are a poor sailor then taking seasick tablets is the way to go. Some brands make you drowsy so have them the night before - that is if you get ones that last 24 hours, of course. About one third of the way from Whakatane you get to see Whale Island which, as the name would suggest, has the shape of a whale. Of course it does depend upon the direction you are looking - I reckon it looked like a swordfish on the open-ocean side - but for the most part it is sperm-whale-like. Although overcast when we began our trip the sun soon began to burn off the cloud and by the time we had gone half-way - about 25 kilometres - the sky was becoming blue. Despite its name White Island is actually a browny, grey from a distance and got its title from Captain James Cook who saw the steam pouring off it and didn't go close enough to see what was causing the whiteness. A note here. 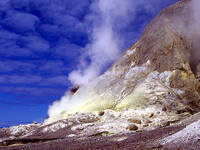 White Island is an active volcano and it can erupt at any time. It is also very changeable pouring steam out at one time, doing almost nothing the next. So before we got into the inflatable boat to go to the island we were issued hardhats and gas masks. 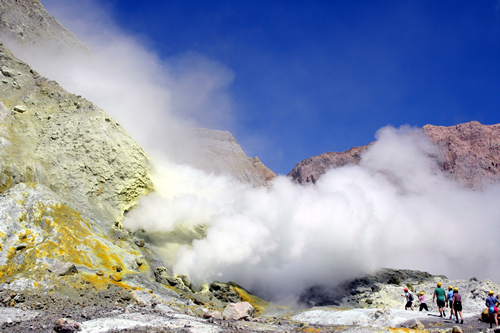 The fumes on White Island can affect some people - with headaches or nausea - so we would recommend wearing the masks. At the ancient dock you climb up some steel ladders, along a concrete wharf, over some rusting steel bridges and then clamber over rocks to hit the beach - and there you are on a live volcano. There you assemble into two groups - each with two guides - and get safety instructions on what to do if an eruption occurs. I have to 'fess up to missing most of that talk as I was too busy clicking away getting photos. From what I heard one thing to do was crouch down behind a big object like a mound and wait for it to pass. Prayer would help too, I guess. So it was then a nice leisurely walk around New Zealand's only live maritime volcano. 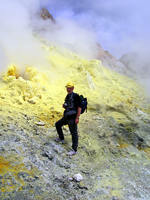 The guides are very experienced and have visited White Island on countless occasions. They have masses of information about the volcano, its history and the tragedies that have occurred among miners there. In our group we had several elderly folk who managed the journey with ease. Mind you their super-modern walking sticks made it look as if they had done this sort of thing plenty of times before. I still kept a bit of an eye out for them. The crater of White Island is actually three separate ones that have joined together and you can see the parts of the opposite walls where once they had connected - before the eruptions that is. The crater lake - fairly recently formed - is a turquoise colour and steams like many similar ones in the geothermal area of Rotorua. Initially White Island seems a bit bland, lots of brown colours and stone (sulphur holes aside), but once you've been there a while you begin to pick up on the more subtle hues in the cliffs and landscape. 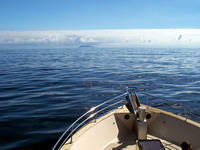 On a sunny day the deep blue sea and sky make a wonderful contrasting background for your photos. After almost two hours on the island it was time to get back on board and most were a little reticent to leave the volcano. Then it was lunch and a superb trip home. Going with the swells we fair flew back to Whakatane in a smooth fashion. On the way we saw two humpback whales - a cow and her calf - and watched them for about 20 minutes. The crew is happy to stop for a while to give the tourists a thrill. And it was. Then, forced to break off contact because of tides, it was towards the shore again. Making the trip out to White Island is a sensational adventure and can be heartily recommended to visitors to the Bay of Plenty. Peejay Tours is a very smartly run outfit with friendly and knowledgeable staff and everything is well organised and as safe as being on a live volcano to be. My thanks to Mat - he was the guide who had to stick around as this fellow wandered off taking photos - for his excellent company and deep knowledge of White Island. We stayed at the nearby and associated White Island Rendezvous motel and this makes life so much easier as it is just a matter of getting ready and then crossing the road to the waterfront and the boat. 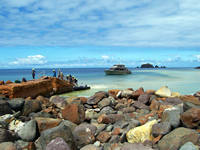 The tour to White Island is a once-in-a-lifetime experience and is a must-do for both tourists and New Zealanders alike.